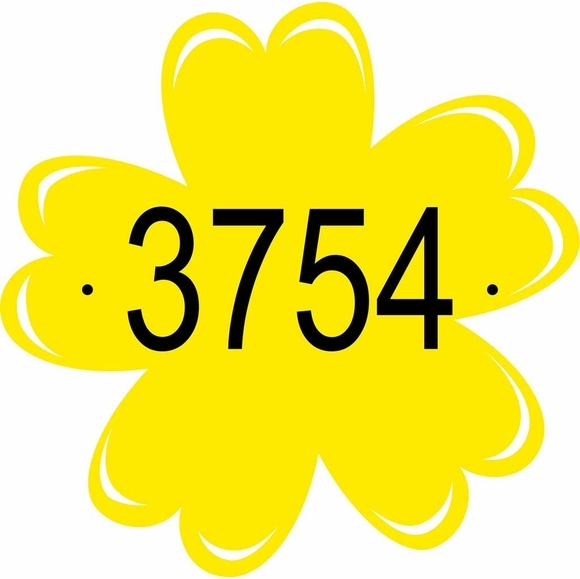 Flower Shape Address Plaque - - personalized house number sign has five-star curb appeal. Large silhouette flower shape address plaque is approximately 10"W x 10"H. Made in the USA. Designed for wall mount or lawn mount with purchase of a Comfort House address sign lawn stake (#CGS24001). Click top link in Related Products to add a lawn stake to your cart. Cutout crescents near the tip of each petal allow the background color to show through. The result is a one-of-a-kind, two-tone color combination as shown in the rightmost small image (yellow on green). Laminated acrylic flower silhouette address plaque crafted in the USA by skilled artisans to assure the highest quality.